Hi, this is my revenue comparison between two viral websites based on June. These two websites are the one using phpviralquiz and the one developed by nametestapps team. Actually it is not fair to compare between these two websites as I just started using nametestapps only after 7th June. So it’s performance cannot be regarded as the whole month performance. And also it is not fair to compare because some of the quizzes performed better than others on each site. But some of the figures from this comparison will help you to choose the viral websites or will help you to develop your viral website strategy. I am not going to say which one is better. I will just describe about my experience. For nametestapps, I spent average 10 USD for each quiz, so there were total 10 quizzes I created Facebook Ads. For phpviralquiz, the maximum spending for single quiz is around 100 USD and the minimum is around 5 USD. Total quizzes I boosted is also around 10 quizzes. Target audience are the same. I am using digital ocean hosting for nametestapps which cost only 12 USD in June. 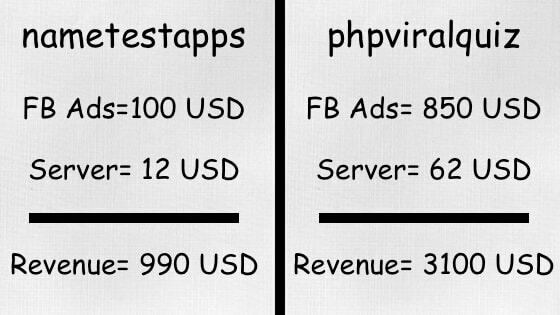 Namecheap VPS for phpviralquiz and it costed me 62 USD in June. I am still using the same till now. This is my revenue comparison between two of my active viral websites. (I am no longer use viralFB and socioquiz. I switch my socioquiz platform to do branding marketing for my clients). Hi, what is the size of nametestapps and phpviralquiz websites? Can you show the admin area of nametestapps? Phpviralquiz zip file size is around 28 MB. For nametestapps, it is not a script. They will build website for you. So I don’t know about it’s size. nametestapps admin area is quite complex. You have to learn at least an hour to understand it’s nature. But after you know, it becomes too easy to create. But because of it’s complex nature, it offers rich features. drop your email. I will send screenshot of nametestapps. Hi, what is your email? I will send an email to you and you can send the screenshot to me or you can send it to the email address I used to comment here(not mentioning my email for privacy). Another thing, does your website in your local language or is it mix with English? Thanks. Ok. I will send to you. I got your email. As our language is not supported by Google yet, for a quiz title I have to use English, but on the image, I use our local language. I visited your website, what script you are using on that site? There’s an error on the header. I use Opera mini to view your site. Hey Aung, thanks alot again for an amazing post. – This renevue is ONLY from Adsense? Nothing else? – How many users u get daily trying your app? if it’s around 10-15k/daily, it means u get 70k/week, which means u get around 200-250k users every month. Is is even possible to get so much people use your site? 200k users every month will make you site as viral as nametests and playbuzz..
– Do you publish Facebook Ads for every quiz while other ads for other quizzes are online or you publish every time only one quiz per day? Do you spend the 10$ that you spend for each quiz only on the day you create the quiz? I mean if you create now a quiz, you invest 10$ for today, publish it on facebook ads, and that’s it, you don’t spend more time or money on publishing this quiz? Yes. This is only from AdSense. No. Nametests and playbuzz has million of users every month. Mine is only around 200k users every month. Some of my competitors websites have more than 200k per month. My daily users range from 10k to 25k depends on the viral nature of the quizzes. – Do you publish Facebook Ads for every quiz while other ads for other quizzes are online or you publish every time only one quiz per day? I don’t create FB ads for all the quiz. I create only for the best (I think it will go viral) one. But I try to publish one new quiz everyday. I have a staff who help me to create a quiz everyday. Do you spend the 10$ that you spend for each quiz only on the day you create the quiz? I mean if you create now a quiz, you invest 10$ for today, publish it on facebook ads, and that’s it, you don’t spend more time or money on publishing this quiz? I creat an idea, ask my staff to design and create the quiz. He posts it on Facebook pages (three pages), then I created Facebook ads. Sometime I distributed 10USD across three pages, but sometimes I spend 5 USD per page. If the quiz really go viral, I keep extending budget on this quiz till it stops its’ viral nature. Hey, do you think that if you’ll invest 1000$ instead of 100$, you’ll make 10k/month? Why don’t u invest more and more to earn more and more? Ok. I will try to reply by comment by comment of you. To invest more and more, I have some limitation. First one is I afraid of getting AdSense policy changes or something which make my account disabled. Because I don’t want to reply 100% on Online thing. I had some painful experience with Facebook advertising system in the past. So I set my limit myself not too invest on this. Coz we have to pay Facebook before we get money from google. So the maximum limit I set for Facebook Ads is around 1500 USD per month. Secondly this is my 6 months experience with viral websites, I even don’t know in detail about it’s nature. so that I would like to see RPM, CPM trend and would like to do more detail analysis before investing huge on it. (coz everyday, RPM, CPM is changing). Thirdly I have other businesses which consumed a lot of money every months as these are start up projects. So I am struggling to allocate my budget between these projects and also viral websites. socioquiz platform to do branding marketing for my clients !!! seems interested , wanna know more about this !! Check this quiz. I created this quiz to promote my E-commerce website. But sorry, it was in my local language. Are you still earning from viral quiz sites. I need a special suggestion from you for purchase. What would you suggest for purchase PHPViralQuiz or NameTestApps. I am criticizing the authors but for my sack I am asking a suggestion. You can mail me if you can’t say here. Hi, I am using both at the moment. Each one has pros and cons. If you don’t need more advanced features like Facebook apps, you can go with PHPviralquiz. But if you want advanced features and some customized help, Nametestapps is more powerful on it. In term of after sale support, I would like to recommend Nametestapps.